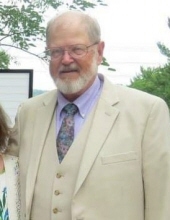 John Wayne Noel, 70, of Charlotte Court House, VA passed away on December 2, 2018. He was born in Farmville, VA to the late John F. and Mabel “Sweetie” Hunt Noel on March 25, 1948. He loved to play guitar and in his youth played in a band “The Satisfactions” and continued to play all his life. He was quite the athlete, playing football in high school and college. He served his country for 23 years as a submariner in the Navy as a Russian linguist. His shipmates knew him as “Tovs“. He retired from service and taught school for 25 years, retiring from Randolph- Henry High School. He was married to his wife of 33 years Carol Noel and together raised 2 daughters. He was a faithful member of Farmville Baptist Church. He is survived by his wife; 2 daughters: Sarah Noel and Elizabeth Noel (Mark Colombo) both of Alexandria, VA; 2 brothers: Howard and Eddie (Mary) Noel. A funeral service will be held on Saturday, December 8, 2018 at 11:00AM at Farmville Baptist Church with interment to follow in Trinity Memorial Gardens. Family will receive friends on Friday, December 7, 2018 from 6:00PM – 8:00PM at Puckett Funeral Home. To plant a tree in memory of John Wayne Noel, please visit our Tribute Store. "Email Address" would like to share the life celebration of John Wayne Noel. Click on the "link" to go to share a favorite memory or leave a condolence message for the family.